The United States has a responsibility to refugees and asylum seekers rooted not only in our collective humanity, but in our laws. The current administration’s narrative, policy changes, and proposals seek to corrode public confidence in the asylum system, demonize asylum seekers, and erode protections for them. 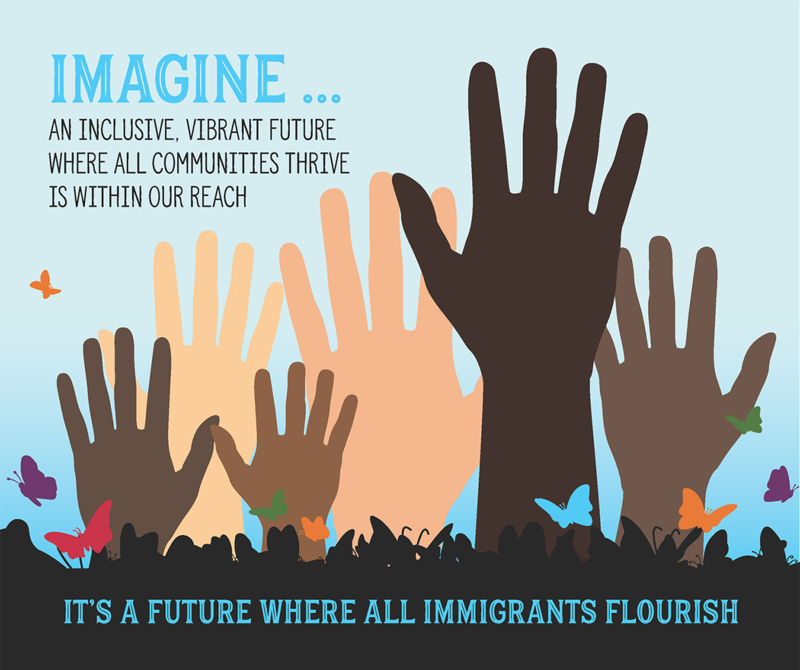 In response to these attacks, Grantmakers Concerned with Immigrants and Refugees (GCIR) partnered with the Four Freedoms Fund to commission an analysis of challenges to the system and opportunities for intervention. This summary is based upon “Memorandum on Challenges to the Asylum System, Points of Leverage, and Advocates’ Recommendations to Grantmakers,” prepared by our consultants, Andrea Black and Joan Freidland. 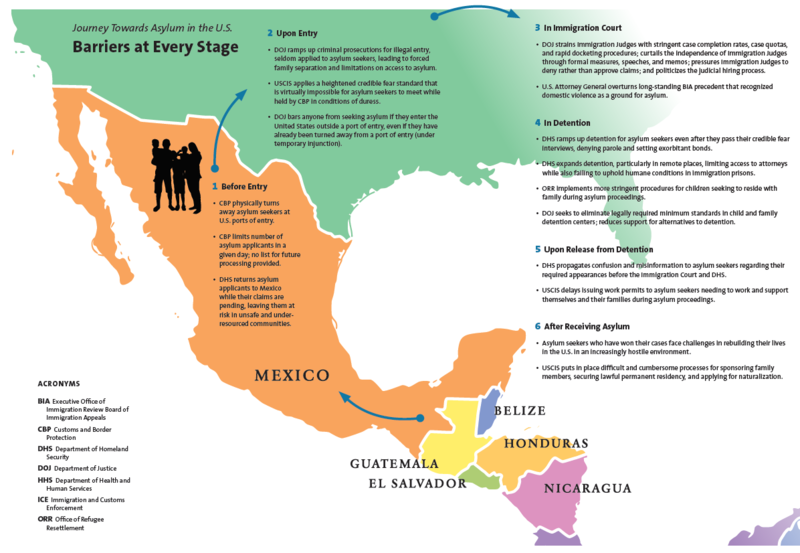 Although barriers are being erected at every stage of the U.S. asylum process, there are key leverage points for philanthropy. Today, in the global arena, more than 68 million people have been forced from their homes, including nearly 25 million who have been formally designated as refugees. Root causes driving forced migration are often overlooked or ignored by governments, and, at times, exacerbated by foreign policies that do not take into account humanitarian impact. Rather than addressing root causes or providing protections, U.S. policies over the past two years have focused almost exclusively on erecting barriers to prevent individuals and families from seeking asylum. CBP physically turns away asylum seekers at U.S. ports of entry. CBP limits number of asylum applicants in a given day; no list for future processing provided. DHS returns asylum applicants to Mexico while their claims are pending, leaving them at risk in unsafe and underresourced communities. DOJ ramps up criminal prosecutions for illegal entry, seldom applied to asylum seekers, leading to forced family separation and limitations on access to asylum. USCIS applies a heightened credible fear standard that is virtually impossible for asylum seekers to meet while held by CBP in conditions of duress. DOJ bars anyone from seeking asylum if they enter the United States outside a port of entry, even if they have already been turned away from a port of entry (under temporary injunction). DOJ strains Immigration Judges with stringent case completion rates, case quotas, and rapid docketing procedures; curtails the independence of Immigration Judges through formal measures, speeches, and memos; pressures Immigration Judges to deny rather than approve claims; and politicizes the judicial hiring process. U.S. Attorney General overturns long-standing BIA precedent that recognized domestic violence as a ground for asylum. DHS ramps up detention for asylum seekers even after they pass their credible fear interviews, denying parole and setting exorbitant bonds. DHS expands detention, particularly in remote places, limiting access to attorneys while also failing to uphold humane conditions in immigration prisons. ORR implements more stringent procedures for children seeking to reside with family during asylum proceedings. DOJ seeks to eliminate legally required minimum standards in child and family detention centers; reduces support for alternatives to detention. DHS propagates confusion and misinformation to asylum seekers regarding their required appearances before the Immigration Court and DHS. USCIS delays issuing work permits to asylum seekers needing to work and support themselves and their families during asylum proceedings. Asylum seekers who have won their cases face challenges in rebuilding their lives in the U.S. in an increasingly hostile environment. USCIS puts in place difficult and cumbersome processes for sponsoring family members, securing lawful permanent residency, and applying for naturalization. capacity, i.e., staffing, convening opportunities, and other resources, to implement any plans that would be developed. Collaboration and referrals between and among organizations. State and local organizations, particularly those representing asylum seekers, can be better supported to participate in national advocacy, develop partnerships across geographical lines, and have access to resources developed by national groups, particularly in areas such as communications. Refugee resettlement organizations could be supported in adapting their work to encompass asylum seekers. Building organizing capacity. Cultivating and activating the leadership of asylum seekers or asylees would ensure that impacted people have a role in responding to attacks on the asylum system and developing policies to protect and advance the interests of affected populations. A convening to bring together policy, direct service, and organizing strategies would enable subject matter experts and organizers to work together in a meaningful way. Federal advocacy. Although asylum issues have been historically underrepresented in broader immigrant rights advocacy, there are now opportunities to raise key asylum issues through appropriations and oversight and ensure asylum organizations’ capacity to participate and support these efforts. Educating lawmakers about asylum and identifying champions for a more progressive asylum framework and legislative agenda is also critical. Direct legal representation and litigation. Individual representation is essential, both to meet the urgent needs of asylum seekers and as a key part of advocacy, communications, impact litigation, and organizing strategies. Stakeholders identified key ways to innovate through remote representation on bond, technology, pro bono, mentorship models, and wrap-around services. Impact litigation is also critical to stop, derail, or delay the sweeping limits on access to asylum. Effective messaging and communications are needed to increase public understanding and support of asylum issues. Training and empowering asylum seekers and asylees to speak on their own behalf, tell their own stories, and educate policy makers and the general public is essential in shifting the narrative. Research the root causes of forced migration and potential points of leverage for philanthropy, both domestically and abroad. Evaluation of government efforts to address root causes in countries of origin, including promising practices, innovative strategies, gaps, and key challenges. Cross-regional efforts to enforce international protections and bi-national solutions.